THEOG, Sept 5  The civil hospital here is one of the most important and centrally located health centres in the upper Shimla area. Patients from Chopal, Kotkhai, Kumarsain and parts of the Junga area visit it.Unfortunately the hospital is ill-equipped and badly managed.Some posts are vacant while some doctors are on leave, and it is believed to be a regular feature. SHIMLA, Sept 5  The Himachal Pradesh Government today appointed HVC leader Sukh Ram Chairman of the Employment Generation and Resource Mobilisation Committee. SOLAN, Sept 5  Transport Minister Krishan Kapur laid the foundation stone of a bus stand to be constructed at a cost of Rs 2.68 crore near Kather on the Solan-Chambaghat bypass here today. MANDI, Sept 5  A new hybrid seed of maize, "Kanchan Ganga", developed by a Hyderabad company, a pioneer in production of high-yielding seeds in the country, has turned out to be a boon for the farmers in the district. 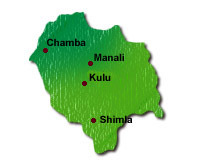 CHAMBA: The Chamba region on the Ravi basin, has a power generation capacity of 350 MW, through small hydro schemes identified by the Central Electricity Authority but much could not be exploited so far. SHIMLA, Sept 5  The Lok Sabha Speaker, Mr G.M.C. Balayogi, will inaugurate an orientation programme for members of the Himachal Pradesh Assembly here on September 16. NURPUR, Sept 5  About 285 kanals of fertile agriculture land with standing kharif crop has eroded at Bassa Dhaliala village because of heavy rain. THEOG, Sept 5  The civil hospital here is one of the most important and centrally located health centres in the upper Shimla area. Patients from Chopal, Kotkhai, Kumarsain and parts of the Junga area visit it. Unfortunately the hospital is ill-equipped and badly managed. Of the eight doctors only two were on duty when this correspondent visited it. Some posts are vacant while some doctors are on leave, and it is believed to be a regular feature. The head medical officer remains on long leave, according to Mr Sandip Jandev, a local HVC activist. There is shortage of doctors a regular and no gynaecologist in the hospital for the past several years, he added. Started in 1946 by Major Bazalgette, political agent for Punjab Hill States, the hospital now presents a dismal picture. Stray dogs crowd the open compound and the entrance. There is nauseating stench all over the hospital. Just below the kitchen, where food for 50 patients is cooked, there are two septic tanks which give out foul smell. Though 50 per cent of the amount sanctioned for the shifting of these tanks from the Health Dept to the PWD is already given but nothing have been done so far, according to hospital staff. This will result in infection, feel most of the patients. The Municipal Committee provided for a canteen for in-door, outdoor patients and their attendants. But for sometime, the contractor who was given the premises by the MC has been running a grocery shop instead of a canteen. The patients and attendants are left with no choice except help from locals, says Mr B.K. Bali, a BDC member. The bazaar is away from the hospital. If the secretary of the MC fails to take action we will go for an agitation against it, says Mr Bali, who is also an activist of the Theog Joint Action Committee. There is shortage of water in the hospital with no provision for its storage. Toilets remain clogged and stink. But these are better and cleaner than that of other hospitals, claims a doctor. A businessman donated a few plastic storage tanks, but these are not of much use as water comes only on alternate days and even after three- four days sometimes. The doctors' duty room is cramped with hardly any space to move about. On an average 250 patients are attended to everyday in the OPD in this 50-bed hospital. The hospital is highly understaffed with many vacant posts of nurse, midwife, ward boys and sweepers. The hospital has an ECG machine but no operator to work it. There is also great need of ultrasound facilities for poor patients coming from far-flung places, who cannot afford to go to Shimla, when referred to there. The hospital does not have an ambulance, according to most of the people, but the doctor-in charge claimed, "it had gone for repairs to Shimla". The Theog Joint Action Committee has also been demanding ambulance services in the hospital for the past sometime. Mr Sukh Ram, facing corruption charges, had resigned as PWD Minister a few months ago. The new assignment has come although various courts have yet to clear him of the charges, amid threats by the Himachal Vikas Congress (HVC) to withdraw support to the BJP government headed by Mr P.K. Dhumal in case the HVC leaders are not given positions in various boards and corporations. The government appointed eight more HVC and BJP activists as chairpersons of various corporations this evening. The working president of the HVC, Mr Vijay Joshi, has been appointed Vice-Chairman of the H.P. General Industries Corporation. Miss Shyama Sharma has been appointed chairperson of the Finance Corporation, Col Chet Ram Chauhan Chairman, Ex-Servicemen Corporation, Mr Vipin Parmar, BJP MLA, Chairman, Khadi Board, Mr Khushi Ram Balnatah, general secretary of the BJP, Vice-Chairman, HRTC, and Mr Randhir Sharma, Vice-Chairman, Small Savings Advisory Board. Mr K.D. Dharmani, a former BJP MLA, has been appointed Vice-Chairman, 20-Point Programme Implementation Committee and Mr Karam Vir Verma Vice-Chairman of the H.P. Forest Corporation. He said the proposed complex would have a total area of 5,100 square metres. It would be a four-storeyed structure with modern facilities like retiring rooms, restaurant, PCO booths, cloakrooms and restrooms for the bus crew. Adequate provisions for private parking would also be made. Mr Kapur said 200 buses would be added this year to the HRTC fleet. The new transport policy, with emphasis on adequate bus services to villages and creation of jobs for the unemployed, would be announced this month. The minister urged upon the Telephone Department to provide single-digit telephone services to all transport complexes in the state. Henceforth, information on seats vacant in long-route buses would be provided to the next important halt to facilitate reservation at such stations. Ninetynine posts of driver and 200 of conductor would be filled this year. It would be made mandatory for all private bus operators to get their drivers trained at the proposed HRTC drivers training school. The occasion was marked by recriminations between the BJP and HVC speakers and sitting Congress MLA Krishna Mohini. The latter took exception to a remark by the district BJP president, Mr Virendra Kashyap, who expressed sympathy with her over "the fact that this constituency had been neglected by the former Chief Minister. He hinted that as she was earlier aligned with the Sukh Ram camp, no development work was sanctioned at his instance during the Congress regime. Ms Mohini retaliated saying that Mr Kashyap seemed to have forgotten that the land for the bus stand had been transferred to the Transport Department at the personal initiative of Mr Virbhadra Singh. Others who spoke included former Transport Minister, Mohinder Nath Sofat and former MLA Sat Pal Kamboj. Mediapersons, who went round several villages yesterday in Balh and Sundernagar valleys, found that the wonder seed had revolutionised maize production and given a boost to rural economy in the district. Karam Singh of Kheuri village said one of the unique features of this seed was that the "cobs sprout at the centre of the plant, thus enabling it to withstand the onslaught of winds". Man Singh of Chakkar, who used the seed for the first time, was expecting double the normal harvest. At Bhangrotu village farmer Inder Singh showed large-sized maize cobs fully covered with grain. Sewak Ram of Gutkar village admitted that the new seed had proved to be a boon. "We were unwilling to use it in the beginning because in the past some new varieties of seeds had caused huge losses to the farmers," he explained. Mr Anil Kumar Mittal, an expert from Hyderabad, said the success of the seed was evident from the fact that while only 150 quintals of seed had been distributed two years ago in the district, the farmers of the district this year had purchased 2000 quintals of "Kanchan Ganga". Mr D.D. Tyagi, Deputy Director, Agriculture, said 48,000 hectares in Mandi district was under maize cultivation. The district was the largest exporter of maize to the plains. Paddy growers of the district had made a breakthrough by producing high-quality basmati rice in parts of Mandi district over the past two years. The area under paddy cultivation had increased from 20,000 hectares to 24,000 hectares. The production of off-season vegetables in the high hills was picking up as these fetched high prices. CHAMBA: The Chamba region on the Ravi basin, has a power generation capacity of 350 MW, through small hydro schemes identified by the Central Electricity Authority but much could not be exploited so far. A 450 kw station was commissioned here long back by the Himachal Pradesh State Electricity Board and two schemes of 5 MW (3 MW at Holi and 2 MW at Sal Hydroelectric Project) are at present under construction. The schemes earmarked for execution through private participation did not yield any result and remained on paper. Power in Chamba is brought from outside, whereas the requirement can be met through such small hydro schemes which, if implemented meticulously, can be completed within three to four years. Since private participation has not evoked response on the physical aspects of construction of these projects, the HPSEB and the National Hydroelectric Power Corporation (NHPC) both have to play an important, vital and key role for hydro-power development. The NHPC has already completed two prestigious hydroelectric projects: Baira-Siul and Chamera projects with a generation capacity of 738 MW (total generation of 22700 million units so far). It has all the skill and resources, including infrastructure, for such ventures and is keen on entering the field of small hydro schemes as well. There are indications that the HPSEB and the NHPC may form a joint venture exclusively for the purpose of small hydro development in Himachal Pradesh and such steps can see the scheme materialising soon rather than remaining on paper for years. Such small hydro schemes are totally eco-friendly without disturbing any environmental aspects including the local population. If planned in phases, much less finance is needed. According to Mr S.K. Dodeja, general manager of the Chamera hydroelectric project, the NHPC appears determined to initiate certain steps on small hydro schemes and indicated that ground survey had been started by the NHPC on seven schemes in the vicinity of Baira-Siul and Chamera II on Joiner, Chanju, Maken, Siul, Kalhel, Sal and Sahoo rivulets the tributaries of the Ravi river. Efforts are afoot to complete the work on draft project report and sanctioning of projects within this financial year so that construction work could be undertaken immediately. It is hoped that the development of small hydro schemes in Chamba district would usher in an era of cottage industries. It can definitely serve the purpose by providing power to the local network, particularly in the rural and hilly areas of this region. According to the Speaker, Thakur Gulab Singh, veteran parliamentarians will deliver lectures on various constitutional and parliamentary subjects during the three day programme. The legislators will also be given lectures on the rules of procedure and conduct of business of the House. The Secretary of the Assembly, Mr Ajay Bhandari, said the programme had been designed to enrich the knowledge of the members in different fields relating to their functions. The Governor, Mrs V.S. Ramadevi, and the Chief Minister, Mr P.K. Dhumal, will also address the members. Residents of another village, Palahdi of Kot Paladkhi panchayat, are also living in constant fear of landslides. Landslides have occurred in the Choti Dhar area during the past one year when 6 km of fertile land was buried under the debris. Rains have also caused soil erosion in the Maira village area of Jawali sub-division. Residents of the area have been demanding that the nullahs should be channelised so that further damage to agriculture land is prevented.